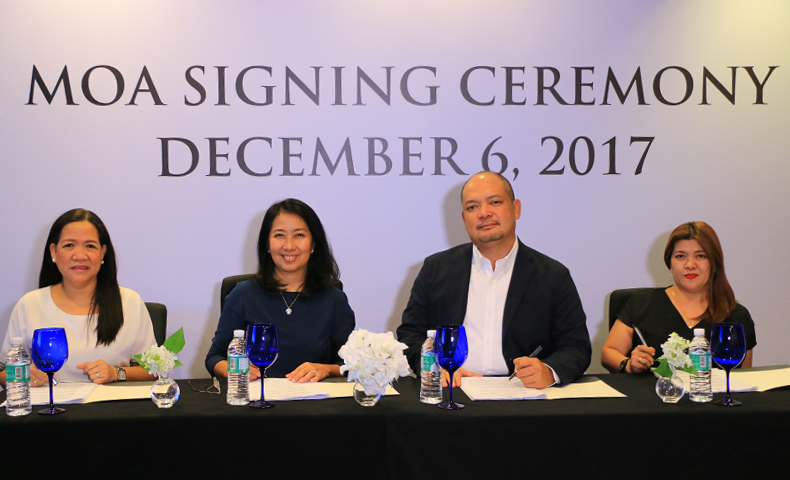 Anvaya Cove, Ayala Land Premier’s first seaside leisure community recently signed an agreement with ABS-CBN Lingkod Kapamilya Foundation’s Bantay Kalikasan to support its environmental initiatives. The signed agreement was for Bantay Kalikasan’s Bantay Langis and Bantay Baterya projects. Under the agreement, Anvaya will donate its used-lead acid batteries and used-oil from their two properties, Anvaya Beach & Nature Club and Anvaya Golf & Sports Club. The used-lead acid batteries and used-oils will be turned over to ALKFI’s recycling partners, Genetron International Marketing (for used oil) and Oriental & Motolite Marketing Corporation (for used batteries) for proper disposal and recycling. The monetary value of the recycled hazardous wastes will be donated to Bantay Kalikasan to support its advocacies for the environment and its 13 eco-tourism sites in the Philippines. In photo: (L-R) Rita Regalado (ULAB Supervisor of Oriental & Motolite Marketing), Noemi Samson (Chief Finance & Services Officer of ALKFI), George Bernard Cadhit (Managing Director, of Anvaya Cove) and Engr. Jocelyn Panen (Technical Sales Director of Genetron International Marketing) during the MOA signing. According to George Bernard Cadhit, the Managing Director of Anvaya Cove, they also have different corporate social responsibility activities that are similar to ALKFI’s programs such as outreach projects. “Now that we have a partner, we are looking forward to more activities with ALKFI”, he said. To know more about ALKFI’s environmental efforts, visit www.abs-cbnfoundation.com.